The Kapil Sharma Show 27th Nov episode: This time Nani and Rinku had opened up the Kapil Sharma show. Rinku arrived on the stage with all her stuff to shift down in Kapil’s colony. She complained of getting ditched of from her husband and her destiny. Nani advised her to go for honeymoon to some really interesting places. They talked little about each other’s life. Then Ranveer arrived the show and explained how he is struggling nowadays promoting and acting himself. After few moments, Nani starts crying because she spotted Rinku with Ranveer. Ranveer pasts the new poster on his house having nameplate on name of himself and Rinku bhabhi. They both started flirting with each other while other watch them being close to each other. 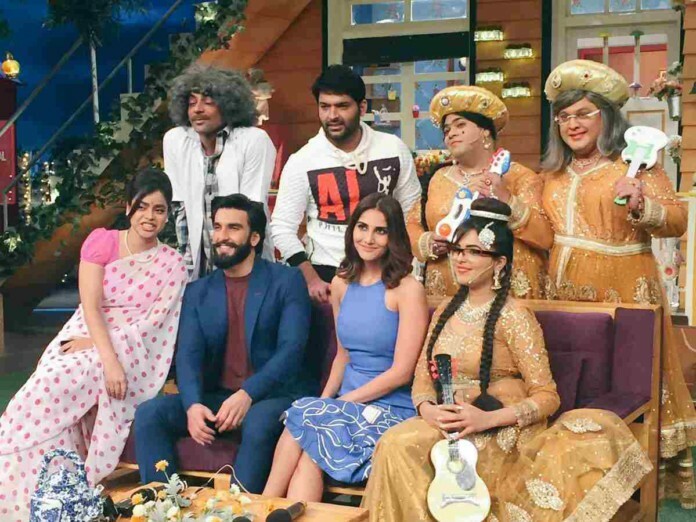 Kapil arrived on the stage with Vaani and accuses ‘fake women’ for disturbing Ranveer Singh. The actor on the stage talked about his experience with Aditya Chopra. Kapil empathises with SRK as he was the same director who didn’t allowed husband and wife having romance in Rab Ne Bana Di Jodi. Ranveer talked that its actually a family film. He tries to make the audience understand that kiss is a factor of love expression in Befikre. Ranvir gone to the next level and kissed Kapil on stage, Kapil demanded from Vaani next moment. Later it was revealed that there are total of 23 kisses of 115 seconds in the entire film. Vaani revealed that after a stage they were not really bothered about mouth freshners etc after a while. Kapil revealed that this time Ranveer is not dying as usual likewise in Gunday, Bajirao Mastani, Ramleela, Lootera and all other his works. He copied a little from Sidhu’s batting style which made everyone smile on the stage. Sidhu now gets in his full role and gave some amazing verses. Kapil later on complained of not promoting by conducting the show in Paris. Afterwards, Ranveer tried to walk on Vaani’s heals and proved himself as the next supermodel of the industry. Sidhu objected when a men wears it, it appears like he is getting bathroom call. The next was the question and answer round, Kapil asked Ranveer whether he found himself in awkward situation of farting in public place and he agreed upon the same. The other question in The Kapil Sharma Show was whether they had used someone’s bathroom and later found flush not working actually. Vaani agreed on the same even after not being asked. Ranveer advised him to use the jet in such case. Sidhu interrupted and tells everyone that once he had entered in ladies bathroom once by mistake at the airport. He reveals he was about to get beaten for all this. Bumber arrived in Mastani’s avatar and started verses for Ranveer aka her Bajirao. She tried to ask about the address of her house. Then the usual fight between Kapil and Bumber continues in the show. The next competition among the candidates were to prove themselves the real Mastani, Nani reveals she is real one. Giving the justification that she is mast+nani and she is the real one.